This Display, based on my previous mini Dino gardens, materialised over the past weekend. We’re all big fans of Dr Who in my household. My daughter knew of Daleks and Tardi (i assume that’s the plural- edit: obviously it isn’t, that’d be crazy) from a very early age. 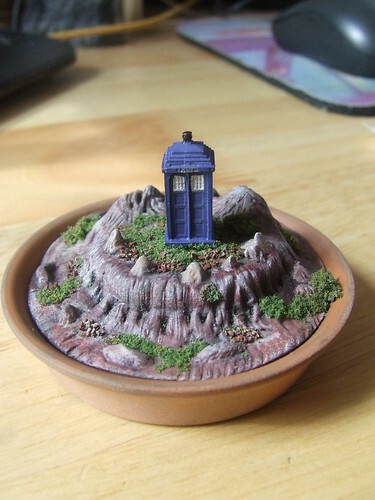 Back to the project, as before, the base is an 80mm saucer that cost 25p from a DIY shop, the landscape is polymer clay, work in progress shots available here and here. Finally it was painted in acrylics and finished with model railway scatter material.